The open letter below is from concerned local resident Kate Styles and is published with her permission. I would like to talk to you about fracking. I know that you think it is ” the right thing to do” ( see, having listened to what you say, .. you do say this a lot. Oh, I get it, it’s a catchphrase. ), but I, and many, many people here in Britain disagree. I know you probably think you know all you need to know about fracking – all those advisers and industry representatives, and lobbyists and DECC, and Defra, and the Environment Agency and UKOOG. But, and I don’t mean this disrespectfully, I think you are like most of us. We know a little about a lot of things and a lot about a little. Now, this may surprise you, but I and many, many others who live in this beautiful land have spent hours, days, weeks and months researching fracking.Some, but not me, have spent years. From building the well pad, transporting the equipment, the rig, the compressors , the water and the pipelines to understanding the drilling process, the fracking process ( yes, we do understand that actually fracturing the shale is just a part of the process), flow testing, and full scale production. We have read about the Marcellus shale, the Utica shale, the Fayetteville shale, the Eagleford shale and the Bakken shale. We have learned about the Halliburton loophole, the EPA, the API and IPAA. We have seen evidence of water contamination from fracking in Texas, Pennsylvania, West Virginia and Ohio. We have read the EPA draft report whose conclusions have been challenged at peer review stage by its own scientists. We have the latest analysis of more than 1,000 chemicals in fluids used in and created by hydraulic fracturing (fracking). Yale School of Public Health researchers found that many of the substances in fracking wastewater have been linked to reproductive and developmental health problems, and the majority had undetermined toxicity due to insufficient information. We have read myriad reports regarding adverse public health impacts on those who live within 5 miles of a fracking site. High risk pregnancies, low birth weight babies, increases in respiratory complaints and chest and heart conditions. We have watched infra red cameras recording toxic gases released through venting and flaring gas and learnt about VOC’s. These volatile organic compounds are nasty – Health effects include eye, nose, and throat irritation; headaches, loss of coordination, nausea; and damage to the liver, kidney, and central nervous system. Some organics can cause cancer in animals; some are suspected or known to cause cancer in humans. And despite this and the earthquakes ( so many earthquakes – more than 30 in Oklahoma yesterday, and 900 in 2015, in a state that historically had one or two per year) that are linked to fracking, it is just business as usual. Despite all the regulators, there doesn’t appear to be changes… No fines, no STOP, no one does anything except talk, and talk is cheap. .In a way, the fact that nothing is done, nothing changes , is as shocking as all the events I have mentioned. To feel so powerless, so impotent against an industry that just keeps rolling along would fill me with despair. We hear that fracking is seen as a bridge to renewables, that it is cleaner than coal, yet we read of rogue methane emissions far more damaging than Co2. Satellite observations of huge oil and gas basins in East Texas and North Dakota confirm staggering 9 and 10 percent leakage rates of heat-trapping methane.Natural gas as an energy source for electricity production is less of a contributor to global warming than coal only if less than 3.2 percent of methane escapes during production. Recent measurements estimate that between 2.3 percent and 17.3 percent of gas escapes. We hear you and your ministers keep talking about “gold standards ” of regulations, yet there are NO fracking specific regulations and there are massive cuts to the very agencies that you tell us will uphold these first class operations. Do you actually know what regulations you refer to Mr Cameron, or is this just a handy soundbite? I will be frank, I sometimes get the feeling you think if you say it often enough we will just take your word for it. Mind the Gaps is a research piece into this very subject that I would suggest is a good place to start. The PHE Report ( superseded by about 350 new peer reviewed studies on fracking and its impacts) gave me a bit of pause for thought.. Anyway, PHE seemed to say that that direct application of the North American research to the UK situation is impossible because of the wide differences between the two countries. Now, studies I have read regarding negative air impacts found NMHCs ( non-methane hydrocarbons ) that surface with the raw natural gas. The USEPA estimates that on average the mass composition of unprocessed natural gas is 78.3% methane, 17.8% NMHCs, – there are other things but I don’t want to get too technical.A literature search of the health effects of the NMHCs revealed that many had multiple health effects, including 30 that affect the endocrine system, which is susceptible to chemical impacts at very low concentrations, far less than government safety standards. You see, the thing that confounded me about what PHE stated is that we are talking about gas here. Do we have different gas in the UK? We listened to you telling us that we would have more power…that local councils would have more power and more responsibility…that localism was absolutely essential to our economic, social and political future. Then, double whammy. Gas storage which had been turned down by the Government previously was suddenly approved after 12 years of being denied planning, AND we were told that decisions about fracking in our local area were going to be decided by Central Government. That the decision of our County Council ( and by definition the people of Lancashire) to not allow fracking was to be taken out of our local hands. 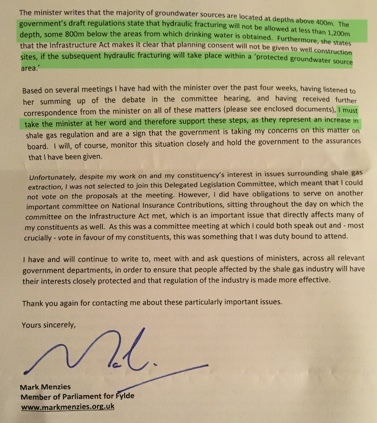 I have heard that law abiding citizens like me, who having read and researched and watched and listened and come to the conclusion that fracking poses unacceptable risks to our air and water and public health are labelled as domestic extremists. People like me, a hard working British mother of two hard working children, and my opposition to fracking is somehow a threat to security? I must have misheard that one. And then there was Paris. A true consensus on the need to keep global warming below 2 degrees. A recognition that we need to end our reliance on fossil fuels. We breathed a sigh of relief because IF we are serious about climate change, we have to keep our fossil fuels in the ground. Therefore, fracking and the rogue methane leaks ( you may remember I mentioned these earlier and if taken into account make fracked gas no cleaner than coal) make it incompatible with our climate change commitments. How do you square that one Mr Cameron? Is it a case of saying one thing and doing another, or is it that you haven’t taken the methane into account? The floods. Terrible scenes of what used to be once in a Century events but that have been occurring much more regularly. Three times in the past 5 years. That’s Global warming for you! I do think we should spend more on flood defences, but don’t let me get off topic. The floods. Yorkshire and Lancashire were particularly badly hit, and this may come as a surprise to you, but 20% of fracking licences are situated on flood plains. Flooding is terrible, but can you imagine consequences of flooding AND toxic wastewater ( there is also NORM in there- naturally occurring radioactive material.It comes up from underground with the 60% of the millions of gallons of fresh water used to frack a well that returns to the surface. Strangely, no one seems to know what happens to the 40% of water that stays underground, not even the fracking companies. One of life’s mysteries!). Not to put too fine a point on it, I am REALLY opposed to fracking. All the things I have mentioned are not the legacy I wish to leave for my children and grandchildren…. jumping the gun a bit here, no grandchildren yet, but I am sure I will get some eventually. I cannot in all conscience justify fracking to anyone, for any reason. And, those of us who are opposed just want a healthy life for those we love. Fresh air, clean water and a future. A future not threatened by fracking or Climate Change and its consequences..
We live with uncertainty. With the threat of fracking in our communities.With the very real risks of fracking pollution. 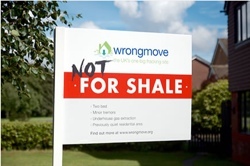 With constant changes to the law that appear to be attempts to hasten the process of fracking and impose it upon those who don’t want it regardless of £100,00 community bribes – ok, community incentives then. Bribes,well, that is just how I see it. We don’t oppose fracking because we are intransigent.. and believe me, we all have so many other things we could be spending time on rather than this protracted battle. We just believe that having seen the evidence, fracking is not the right thing to do. 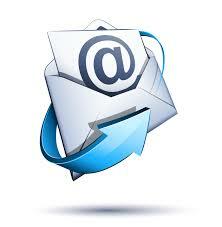 Today we received a response to our open letter to Mr Menzies. It begs the question as to whether he actually read the letter we sent him which clearly laid out the shortcomings of the Statutory Instrument proposed by the Government, which shortcomings had to be admitted to, by the Minister under questioning from members of her very own party. 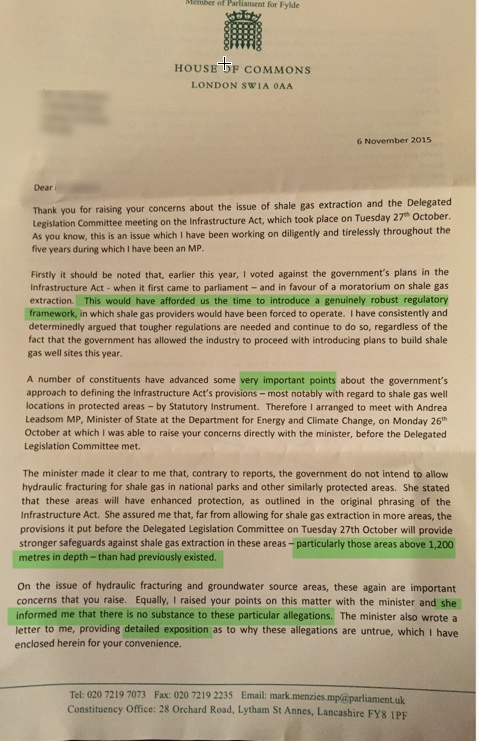 Of particular note is Mr Menzies’ implicit admission that the absence of a moratorium does not allow us to get a “robust regulatory framework” in place, and his readiness to accept the platitudes expressed by Ms Leadsom, in spite of having been provided with a clear analysis of how, in the proposed regulation, there are no restrictions on drilling in SPZ 1, 2 or 3, which would create pathways for possible contamination. Under the regulations as originally proposed, companies would be allowed to drill through any aquifer in any SPZ. There are also no restrictions on surface activity in any SPZs. We think our MP should adopt a more analytical and critical approach to what he is told by his colleagues if he wishes to maintain the respect and support of the local electorate. It certainly isn’t appropriate that he should unchallengingly accept whatever he is told by his colleagues and then repeat the slurs in his column in the local paper. This is what he enclosed from Ms Leadsom – interestingly what he refers to above as “very important points” are seen as “nothing more than scare stories” by his senior, but badly ill-informed, colleague. He subsequently repeated that “scare stories” insult in his column in the Lytham St Annes Express. The fact that firstly Ms Leadsom appears so unaware of the reality, and secondly Mr Menzies seems so ready to be persuaded by her protestations that “there is no substance” to the “allegations”, when it was clear, even to other Conservative MPs like Michael Fabricant, that there was plenty of substance, is a cause of some concern to those of us who look to our elected MP to represent Fylde in Westminster and not Westminster in the Fylde. He also enclosed a further letter from Ms Leadsom. As you can read , it is full of the standard platitudes that we would expect, having listened to her struggling now on more that one occasion. 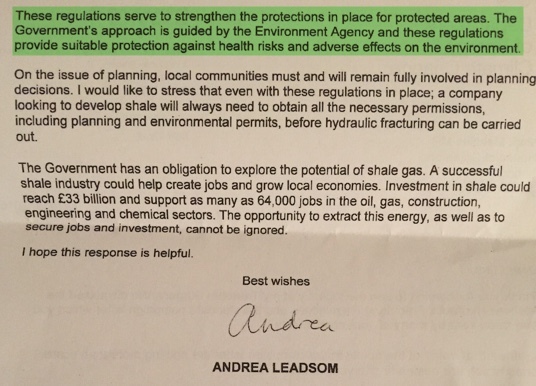 The penultimate paragraph is interesting though as it demonstrates that Ms Leadsom is indeed aware that the SI was deficient in exactly the way that was alleged , and in a way which shows that the government had reneged on its clear undertaking in January that it would ban fracking from National Parks, Areas of Outstanding Natural Beauty (AONBs), World Heritage Sites and Sites of Special Scientific Interest (SSSIs). When the SI regulations were published, they did not include SSSIs in the ban on fracking and they permitted drilling under National Parks and AONBs at a depth of more than 1,200m. Ms Leadsom in an embarrassing U-turn now has to introduce further statutory legislation to remedy the deficiencies and to keep the promises her government made. Exactly as was pointed out to Mr Menzies by Defend Lytham in our Open Letter before the committee meeting. If there is any misinformation and scaremongering going on it is pretty apparent from which direction it is coming isn’t it? Defend Lytham has today sent the following open letter to Mark Menzies, MP for Fylde. You have consistently argued that fracking can go ahead, provided there are robust regulations in place. Those robust regulations must surely start with a commitment to ban fracking from areas that have already been officially designated by law as having high intrinsic value, either because they provide us with drinking water, are important wildlife reserves, and have important landscape value for wildlife, the general public and the local economy. We are therefore writing to you, on behalf of the members of Defend Lytham and the wider community, regarding secondary legislation on fracking that is to be discussed, and then voted on, in Parliament this week. Specifically, we would be grateful if you could answer the following questions before the Committee hearing takes place tomorrow. Will you attend the Delegated Legislation Committee hearing on Tuesday and speak against these flawed proposals? Will you shout ‘No’! to force a division when a motion to approve the Statutory Instrument is announced in the House of Commons? Will you vote against the Statutory Instrument legislation when it returns to the Commons for a full vote? Will you ask for new regulations to be brought forward to ban fracking both in and under SSSIs, National Parks and AONBs and all groundwater SPZs, including a ban on surface works within these protected areas, and a ban on drilling horizontally under these areas from wells situated just outside their borders? We have prepared the following short briefing on the background, wording and implications of the Statutory Instrument that is to be debated on Tuesday for your information. We would be grateful if you could take the time to read it before letting us know the answers to the above questions. In January this year, the Government accepted an amendment to the Infrastructure Bill (now Act) that would have banned fracking in all groundwater source protection zones (SPZs), which are the areas that are designated to protect the aquifers that provide our drinking water. Further to this, during the House of Commons debate on the Infrastructure Bill on 26th January, the then Energy Secretary Amber Rudd also made the following commitment on the floor of the House of Commons: “We have agreed an outright ban on fracking in national parks, sites of special scientific interest and areas of outstanding natural beauty.” Please see the relevant page in Hansard for the above quote. These specific commitments were not, however, included in the text of the Infrastructure Act when it was passed, despite promises to do so on the floor of the House. (6) The Secretary of State must lay a draft of the first such regulations before each House of Parliament on or before 31 July 2015. On 16th July, just two days before the summer recess, Amber Rudd announced the content of the aforementioned Statutory Instrument (or SI), which, as you know, is a method of introducing secondary legislation on Bills that have already been passed). However, the content of this Statutory Instrument broke promises that had been made by the Government to the British public earlier in the year. Amber Rudd’s broken promises were widely reported in the press, as you can see in these articles in The Guardian. As set out by the Environment Agency, Groundwater Source Protection Zones 1, 2 and 3 are areas around aquifers used for drinking water. The water protected by these areas provides a third of our drinking water. SPZ 1 is defined as the total areas in which water would get back to the drinking water source within 50 days, and has a minimum radius of 50 metres. SPZ 3 designates the full catchment area where water would travel back to the drinking water source. 2.–(1) This regulation defines ‘protected groundwater source areas” for the purposes of Section 4A of the (Infrastructure) Act. (2) A ‘protected groundwater source area” is any land at a depth of 1200 metres beneath a relevant surface area. (b) within or above a zone defined by a 50-day travel time for groundwater to reach a groundwater abstraction point that is used to supply water for domestic or food production purposes. The regulations as described above in the SI therefore only relate to SPZ1s – which are defined by a 50-day travel time and within 50 metres, as in 3a and b above – where fracking would be permitted below 1,200m (which is only 200m more than the depth allowed in any piece of unprotected land). However, there are no restrictions on drilling in SPZ 1, 2 or 3, which would create pathways for possible contamination. Under these regulations companies would be allowed to drill through any aquifer in any SPZ. There are also no restrictions on surface activity in any SPZs. This means there are risks of surface and groundwater contamination: if there is a surface spill this could contaminate the surface water and groundwater. All SPZs (1,2, and 3) feed aquifers used for drinking water and should be protected from the high risks of fracking. Definition of ‘other protected areas’. 3. – (1) This regulation defines “other protected areas” for the purpose of section 4A of the (Infrastructure) Act. There are a number of points to make about the above definition of ‘other protected areas’ as defined in the Statutory Instrument. Firstly, it is clear that SSSIs are not included as ‘protected areas’ under the terms of the Statutory Instrument, which means that fracking would be allowed in any SSSI below a depth of 1,000m (the minimum depth of any fracking operation, as defined elsewhere in the Infrastructure Act). Therefore in SSSIs, which are the most ecologically sensitive of these sites, fracking companies would also be permitted to drill from the surface and frack below 1000m. The omission of SSSIs from this legislation has also been strongly criticised by Wildlife Trusts and the RSPB has pointed out that nearly 300 SSSI have been included in the 14th Round of PEDL licences, and has again called for fracking in these areas to be banned. While the text in the Statutory Instrument appears to ban fracking in National Parks and AONBs, it is very important to note that the Statutory Instrument specifically defines these areas as areas of land at a depth of less than 1,200 metres from the surface. This means, in effect, that the National Park stops at a depth of 1,200 metres and becomes ‘Crown land’, thus available for potential fracking. At this point it is important to note that the definition of ‘hydraulic fracturing’ in the context of the Infrastructure Act is very limited, and refers only to the actual process of fracturing rock underground, not the whole process of drilling and production. 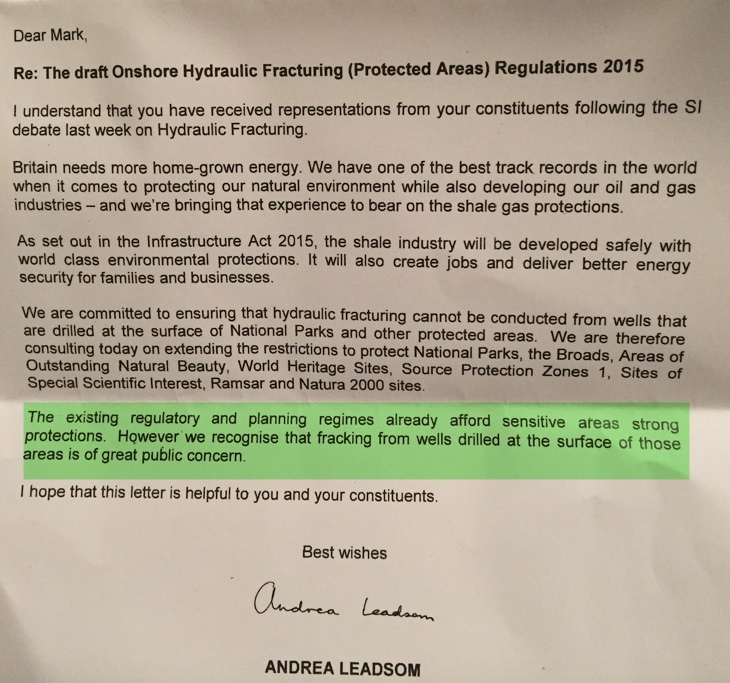 This is specified in Section 4A, Point 1 of the Infrastructure Act, where ‘hydraulic fracturing’ is defined as ‘fracturing of shale or strata encased in shale’ – ie the underground fracturing of shale rock only – not the surface works that would inevitably accompany such hydraulic fracturing. It is therefore significant that there is nothing contained in the Statutory Instrument or the Infrastructure Act itself to limit any surface works, such as establishing of well-sites or drilling of wells, including within the boundaries of National Parks and AONBs. So, given that the National Park or AONB only extends 1,200m below the surface, the scenario of a fracking company drilling through the park to fracture the rock underneath would not be prohibited under this legislation. 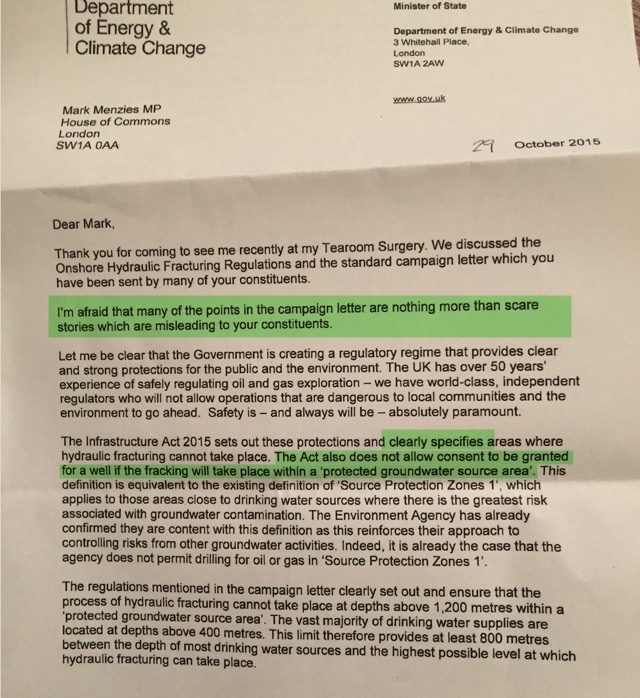 This means that there is nothing within the Infrastructure Act to prevent fracking companies from being allowed to drill from the surface in National Parks and AONBs, as long as they frack below 1,200m (which they would have to anyway, as the Bowland Shale is about 2-3,000m below the surface). Fracking companies would also be allowed to set up their drilling rigs around the edges of these areas and drill horizontally underneath them. This Statutory Instrument legislation is to be debated at a Delegated Legislation Committee on Tuesday, October 27th, at 2.30 pm – Committee Room 9. The committee is made up of 18 MPs, only one of whom has the threat of fracking in his or her own constituency. Any MP is allowed to attend the DL Committee meeting and speak in favour or against the legislation, although only those on the committee can vote. After the DL Committee has met, the SI needs to be formally approved by the Commons. This means that on the next day, or soon after that, a motion for its approval will appear as one of the final items of business on the daily Agenda (or Order Paper). If enough MPs shout ‘No!’ when this motion to approve SI is announced, it will force a division and there will need to be a full vote in the house (although sadly not a debate). This vote will not be on the same day, but would normally be deferred until the next Wednesday (4th November). Having read our briefing, we would be grateful if you could answer the following questions and either email your responses or post them on your website before the Committee hearing on Tuesday. 1 Will you attend the Delegated Legislation Committee hearing on Tuesday and speak against these flawed proposals? 2 Will you shout ‘No’! to force a division when a motion to approve the Statutory Instrument is announced in the House of Commons? 3 Will you vote against the Statutory Instrument legislation when it returns to the Commons for a full vote? 4 Will you ask for new regulations to be brought forward to ban fracking both in and under SSSIs, National Parks and AONBs and all groundwater SPZs, including a ban on surface works within these protected areas, and a ban on drilling horizontally under these areas from wells situated just outside their borders? You have been clear that if shale gas extraction is to go ahead it can only do so with robust regulation and strict environmental controls in place.. We ask you to demonstrate a visible commitment to this position by voting against this secondary legislation and asking the government to draft comprehensive legislation to ban fracking in and under legally protected areas. Thank you for taking the time to read our letter, and we look forward to hearing your response as a matter of urgency. I am a retired but still active bishop in the Church of England. Formerly a vicar in York for 14 years. Later I was Bishop of Maidstone in the Diocese of Canterbury, then working nationally for the Archbishop’s in partnership with five other Christian denominations. I am speaking this evening in my own capacity, not on behalf of the Church of England or the Diocese of York. But I’m not a NIMBE. I’m a NIABY (Don’t look for it in a dictionary – I made it up) Not In Anyone’s Back Yard. I believe fracking raises moral issues, and is a threat to human flourishing. Tonight I want to explain why. I spoke recently on the phone to the Energy Editor of the Daily Telegraph. She had contacted us because we are local residents opposed to fracking. She heard my reasons and then said ‘Do you mean you think this is a moral issue?’ It didn’t seem to have occurred to her before. So let me give you my reasons. You do not have to be a believer in God to share these, and most of my comments will not be exclusively religious, but I am a Christian leader and faith communities bring an important perspective. Christians share with the adherents of most faiths that we are answerable to the Creator, for the way we treat creation: That the planet is a gift, not a possession just to use as we wish. In it the Pope says ‘The climate is a common good, belonging to all and meant for all.’ He appealed for a rapid reduction in the use of fossil fuels. His stance was endorsed by the Dalai Lama at this year’s Glastonbury Festival. ‘As leaders of the faith communities we recognise the urgent need for action on climate change. Climate change is already disproportionately affecting the poorest in the world. The demands of justice as well as of creation require the nations of the world urgently to limit the global rise in average temperatures to a maximum of 2oC, as agreed by the United Nations in Cancun. We have a responsibility to act now, for ourselves, our neighbours and for future generations. My views on the morality of fracking are set within the overarching issue of climate change, and our responsibility to our neighbours and for future generations. In particular, the fact that we can extract shale gas, is no moral reason that we should. If we want to avoid taking unacceptable risks with the planet we need to leave most of that fuel in the ground – either forever or at least until there’s an affordable and scalable way to stop the gases building up in the atmosphere. I’m a child of the 60s, and I used to have the long hair to prove it. The 60’s had two mottos. ‘Do your own thing’ and ‘All you need is love’ But . ‘Do your own thing’ eventually destroyed ‘All you need is love’ In 1970 I sat in a field in the Isle of Wight for three days to hear Jimi Hendrix, the Doors, The Who and many other bands. I find it slightly ironic that 1970 is also the key date for the start of the marked increase in carbon emissions. I hope not triggered by the 600,000 of us who crossed the Island to get to the festival! Moral choices are rarely black and white, they are judgements about the effects of our actions. Jesus teaching about ‘doing to others as you want them to do to you’, and ‘loving your neighbour’ has abiding relevance. So my question is how does fracking effect others? What are its moral consequences? When Jesus quoted the text ‘love your neighbour as yourself’ he was asked ‘Who is my neighbour’ He then told the story of aid to a person in need, across racial and religious boundaries. We call it the parable of the Good Samaritan. So who is my neighbour when it comes to fracking? Whom do I have a moral responsibility to help? If you support an Aid Agency: Oxfam, Christian Aid, Cafod, Tear Fund, Muslim Aid, Islamic Aid and so on, you will find them all campaigning about climate change. Because they are dealing with its consequences in the poorest parts of the world now, and they try to address the causes in the West as well as the consequences in the South. I was a bishop in the Diocese of Canterbury, and we were twinned with the Anglican Church in Madagascar; with Bishop Gilbert, Bishop Todd. It is one of the poorest countries in the world. The impacts of climate change in Madagascar directly threaten the survival of the island nation’s unique biodiversity, and the welfare of its people. Earlier this year my wife and I visited South Sudan, a country devastated by decades of war, to support the development and other work of a new friend, Bishop Moses. But rainfalls have decreased in South Sudan by 10-20 % and temperatures have increased by more than 1 ºC (It got to 42 when we were there.) since the middle of the 1970s. The new nation’s Ministry of Environment has established a climate change unit but it is not operating due to lack of financial and human resources. My colleague the Bishop of Salisbury recently led a delegation to Tanzania recently, in preparation for the General Synod debate; because Tanzania is one of the African nations most vulnerable to climate change. Jackie and I remember meeting Bishop Michael, leader of the little Anglican Church in Bangla Desh, the nation most vulnerable to climate change in the world, where rises in sea level are devastating in a land already subject to serious flooding. These are not distant lands to us, they are the homes of friends and colleagues. To give to aid agencies which are working to ameliorate the consequences of our carbon emissions, while approving the sourcing of a new fossil fuel, shale gas, is a moral contradiction. We, in the developed nations, have a moral responsibility for the effects of our energy policy on other nations. Climate change is also an ‘intensifier’ of other problems and conflicts in these nations. It makes them harder to solve. (You have all heard of Darfur, where climate change aggravated an already bitter conflict.) We have a problem with migrants, with refugees at the moment. It will seem trivial if we fail to reduce carbon emissions and more land becomes desert or perpetual flood. Prepare for the arrival of the climate refugees. Climate Change effects the poor of the earth now. 50 years on it will effect everywhere..
‘Intergenerational solidarity’ involves choices about what sort of world we pass on to our children. To give to Save the Children or Children in Need while supporting fracking is a moral contradiction. Our home, where we are part of a ‘community of creatures’. In our recent history we have treated the earth a though it was the local take away open 24 hours a day. Have as much fast food as you like! But it is our own home, which we are degrading by our way of life. To change the metaphor, we are in danger of cutting off the branch on which we are sitting. According to a recent analysis of 131 research reports,[xi] one in six of the planet’s species will be lost forever to extinction if world leaders fail to take action on climate change – a tragedy with serious ramifications for people as well as ecosystems. The study suggests that the risk of extinction accelerates with every degree increase in global temperature, But even if governments do manage to hold global warming to 2C, one in 20 species (5.2%) still face extinction. Flamingo Land is in our village. Its partnership with the University of York Environment Department, the Udzungwa Forest Project[xii], is an integrated conservation, research and education project based in Tanzania, one of the country’s most threatened by climate change. How ironic that Ryedale could be simultaneously a source of increased carbon emissions, and the home of a program for conservation aimed at reducing the damage they cause! For the sake of the planet, and its biodiversity, we need to keep shale gas in the ground. My first concern is wellbeing. To frack here is contrary to the long term wellbeing of this district and county. This conviction has been arrived at cumulatively. I took time to make my mind up. But then I read the House of Commons Environmental Audit Committee report from last January[xiii]. Compiled by a cross party group of MPs including Caroline Spelman, who was Secretary of State for Environment, Agriculture and Rural Affairs. The report lists question after question where there are unsatisfactory or unproven answers. Groundwater quality, the quantity of water required, waste water and its safe disposal, air emissions, methane (20 times as damaging as CO2 as greenhouse gas), health as we have heard tonight, habitat and biodiversity, seismic activity as in Lancashire, noise and disruption, and inadequate and fragmented monitoring regimes. We need much better answers if we are to believe that fracking is safe and good. At the Westminster Hall debate on shale gas, initiated by our MP Kevin Hollinrake, one of the contributions was by Alan Whitehead MP, also an author of the Environmental Audit report. ‘The estimates are’ he said ‘that, in order to divert, let us say, 10% of our gas supply from conventional gas into shale gas we would need to drill somewhere between 10,000 and 18,000 wells, and they would have to be re-drilled over a period. Of course, those wells would not be evenly distributed throughout the country. Wells would be concentrated in the two areas of the UK where there are reasonable shale plays. Those shale plays are geologically faulted and difficult to get at; nevertheless, they are the main areas: Bowland shale in the north-east of England and across the weald in the south. We are in danger of undermining the long term prosperity of this area – tourism, food, agriculture – for dubious short term energy gains. It is absolutely crazy to do so at this time – After The Tour de France and Tour de Yorkshire have drawn the attention of the world to this beautiful place. It is not just the National Park and Areas of Outstanding Beauty. It includes all that you can see from them, and what you are doing under them. Let alone the wellbeing of local communities. So for the sake of Rydale we need to keep shale gas in the ground. So for the sake of Kirby Misperton, and all the other local villages, we need to keep shale gas in the ground. It has no ‘social licence’ and if it is imposed, then democracy will be further undermined. Such is the seriousness of carbon emissions that there would need to be a strong moral case in favour of developing a shale gas industry in the UK, rather than establishing a moral case against. The only possible moral reason to allow fracking, assuming it were safe, would be as a brief interim solution until renewables can replace fossil fuels. ‘To keep the lights on’ as they say. Or we breach our international climate change commitments. Most troubling have been our new Government’s commitment to ‘deliver shale’, while cutting subsidies on renewables. Especially concerning is the axing of plans to make new homes carbon neutral from 2016. It does look as though the policy is for shale gas to substantially replace renewables – or that will be the result id not the intent. Either way that is disastrous for the planet. In other words, we have a moral responsibility to act on this. In other words there is a better way. Fracking is being promoted as part of the delusion that climate change is not really as serious as the science indicates. Or that it can be solved without significant changes in our way of life. The problem is not that the science is wrong, but that it is inconvenient! That is a moral issue. There is great generosity in the UK – we give when there is an overseas crisis, but at the moment we also fail to recognise that we are contributed to the greatest crisis of our age. Some energy companies speak of ‘Sacrifice zones’ to describe the areas most impacted by their activities. But climate change requires a different form of sacrifice of us all – we need to keep less lights on. There are two forms of immorality – doing what is wrong, and doing nothing about what you know to be wrong. The greatest moral threat, to which fracking contributes, is being blind to the possibility of a genuinely better life. If we use shale gas and other fossil fuels to try to sustain our current way of life, all we do is degrade it – carbon emissions have no mercy. But we have the God given ingenuity and creativity, as the British Academy suggests, to create a better, more sustainable way of life more in tune with the limits our planetary home impose on us. I oppose fracking for the sake of my neighbours, and in favour of a better way of life. (e) encourage parishes and dioceses to encourage prayer and fasting for climate justice on the first day of each month. [ix]The Revd. Professor Michael Northcott is the Professor of Ethics at the University of Edinburgh and a leading authority on the ethics of climate change. The Revd. Professor Michael Northcott is the Professor of Ethics at the University of Edinburgh and a leading authority on the ethics of climate change. Defend Lytham are not surprised to hear that Cuadrilla have requested a deferral in the determination of their planning applications. No doubt they are uncomfortable about LCC councillors deciding the fate of their exploration wells in a week where the former Conservative Environment Secretary, Caroline Spelman has called for a moratorium on shale gas exploration, citing concerns over climate impact, and when the fracking related proposals in the Government’s hugely unpopular Infrastructure Bill will be coming under intense scrutiny. It is hard to understand how, having failed to satisfy the planning officers in the first instance they now expect to be allowed back for a second bite of the cherry, and we note that whilst they claim to be able to reduce the noise from their activities to a level no greater than 37dB, they appear to have had problems in Balcombe (1) keeping to the 42 Db limit imposed by the council there, and had to stop work whilst this was investigated. We also have some serious concerns over the other impact issues with which the Planning Officers declared themselves satisfied, and we would like to raise a question as to whether some of the assumptions made in the Report are in fact acceptable under the National Planning Policy Framework. Today the Environment Agency finally granted Cuadrilla their environmental permit which was need to allow them to extract shale gas at their proposed site at Preston New Road, Little Plumpton. The Environment Agency had made it clear last November that they were minded to grant Cuadrilla the environmental permits needed to carry out their operations so this news comes as no surprise. We have serious concerns about Mr Molyneux’s ability to ensure that the lengthy permit conditions are in fact enforced. The EA’s ability to do so is highly questionable given the recent decimation of staff as a result of the 15% budget cuts at the environment agency in 2013. As a result it is likely that we will have to rely on Cuadrilla complying with these regulations voluntarily – effectively marking their own homework – at a time when the financial pressure on the shale gas companies is increasing with every downward lurch of the price of oil. Defend Lytham are worried that financial pressure may lead to corners being cut (as happened in the Gulf of Mexico disaster). Cuadrilla’s previous track record on complying with regulations at Banks near Southport and in Balcombe does not inspire much confidence. Defend Lytham are pleased to announce that Mike Hill, Chartered Engineer from St. Annes and BREF EU Commission Member MTWR (incl. shale gas) will be one of the speakers at a Seminar held by the Institution of Engineering and Technology on Tuesday May 20th 2014. The RS/RAE produced a report in June 2012 “ A Review of Hydraulic Fracturing “ which made 10 recommendations, but as only one of these has actually been implemented by the government, the debate should prove lively and informative. With the recent announcement of 8 shale gas wells to be hydraulically fractured in the Fylde, this topic will be of interest to all watching the development of this new industry.